Here they are…the highlights from the “Dumpling Night” held at the Museum of Chinese in America. 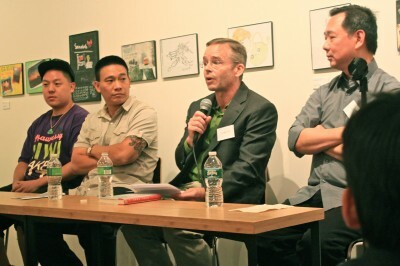 I had the pleasure of moderating the panel discussion that was central to this sold-out talk & tasting event. If you go to my earlier post about this special evening, you’ll find lots of links to the best Chinese-inspired dumplings in the city. A video with fun snippets from that July 31st food fest is now up on MoCA’s website. You can watch it by clicking HERE. Alas, my dulcet voice didn’t make the cut for the highlights. So while you see me holding a mic and looking very busy, you don’t get to hear anything that I said — and I had great material on each of the panelists. My intros for each of them covered stuff that you won’t find online or anywhere else (yes, I did my homework!). My introductions for each of them are below. They were such interesting speakers. At 28, Eddie Huang is pioneering what he calls Taiwanese street food. New York discovered it last Christmas Eve when he opened Baohaus, a small snack shop on the Lower East Side that serves variations on one item, the Taiwanese bao. He’s gotten tons of press for his creation – and for being Eddie: an outspoken personality who blogs and twitters about food, the New York scene, and his life. He has brought his younger brothers Evan and Emery into the business. The Huang boys have training in working together. They are from Orlando, Fl., where they grew up helping their Taiwanese immigrant parents, who own steakhouses and Italian restaurants there. 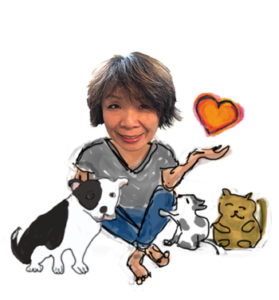 Now at age 55, Kian is making that happen by cooking at private events, teaching Chinese cooking and pouring his soul out on his blog. He and his partner live in Harlem, where an invitation to dinner is something we’re all looking forward to. Chris Cheung dishes up what he calls “evolutionary Chinese cooking:” upscale Chinese-American food made with Western ingredients. It’s a cuisine based on his roots as a city kid who worked at some of New York’s most popular restaurants. He first learned to cook in 1991 at New York Restaurant School. After an internship at Vong, he went on to cook at Judson Grill, Nobu, Typhoon Brewery and Jean Georges. After that, he was chef at Thai Grill, Celadon, Ruby Foo’s, Tiger Blossom, Little Bistro, Almond Flower and Monkey Bar. He is currently executive chef at China 1 and is helping Chin-Chin owner Wally Chin to open a new midtown restaurant called Walle. Chris, who is from Bensonhurst, now lives in Park Slope with his wife and son. He grew up eating in Chinatown while hanging out at the Mott Street apartment of his grandparents, who were immigrants from Taishan (or Toisan). Today, at 40, he is exploring new Chinese influences thanks to his wife, who is originally from the countryside near Shanghai. He’s writing a book about being on the in-laws’ farm, cooking with fresh ingredients over a bamboo-fired wok in a kitchen with no electricity. Andrew Coe is an author who has received great reviews for his seventh book, “Chop Suey.” It was published last year and celebrated for its scholarly research on the history of America’s love affair with Chinese food. In this book, you will read about how Americans and the Chinese first exchanged meals back in 1784. The first Americans had just sailed to China as traders. Their reaction to each other’s food was mutual disgust. But then, Andy takes us through the stages of a romance built on the politics of immigration. Chinese food first became popular because it was cheap, tasty, filling and not very Chinese. Thankfully, we have grown! And the dumpling has played a major role in defining our culinary sophistication. Andy’s passion for food history might be in his genes. He was born 51 years ago to culinary historians who wrote a classic called “The True History of Chocolate.” Andy’s wife is also a food historian. They live with their two kids in Brooklyn Heights and eat out at Chinese restaurants at least twice a week. This was back in the ‘70s, when the school cafeteria served chop suey and called it “Chinese food.” Out of sheer horror and a need to survive, Kian learned to cook Chinese. He went on to complete his graduate degree and work many years as a Wall Street computer analyst. But there was always the call of the dumplings and other dishes. So even though he still works part-time as a tech consultant, his goal of becoming a professional chef is on the front burner. He’s always been passionate about cooking. But he grew up in Singapore in a big Chinese extended family filled with aunties and servants who didn’t want him doing menial labor. He only learned to cook – finally — when he came to America to attend Boston University and study aerospace engineering. 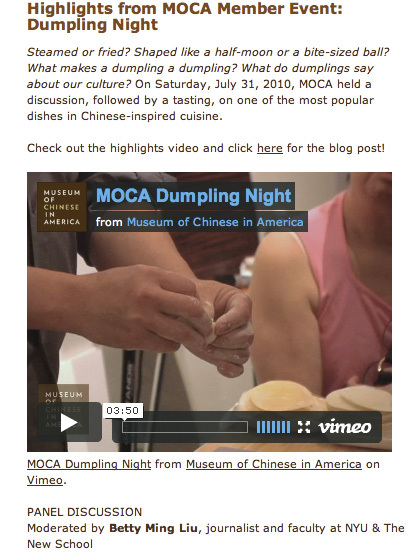 Pingback: Dumpling Night at MoCA!